Explain the law of uniformitarianism. Principal of Uniformitarianism - states that the processes affecting Earth today are the same ones that affected it in the past. Differentiate between absolute and relative time. Compare and contrast how relative and absolute dating techniques are used to interpret the advance of geologic history. 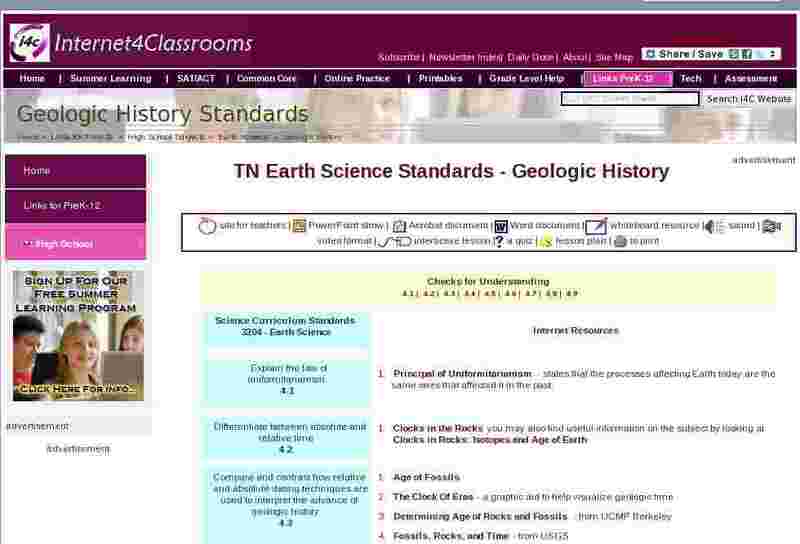 Construct a geologic timetable for the evolution of earth and the history of life. Amber:�Window to the Past - Click on different pieces of amber to find out what is captured inside and what clues the fossilized remains provide about ancient ecosystems. Evolution: Theory and History - including journey into the world of phylogenic systematics. Geologic Time and the age of the earth. Geology and Geologic Time - General history of the science, links to each of the eras and the life in them. Timelines - Travel back to different time periods in the history of the earth. Vivid, fleshed-out reproductions of the extinct creatures appear in scenes depicting their environments as they might have been millions of years ago. Interpret evidence for plate tectonics such as the fossil record, mountain range formation, rock strata, paleomagnetism, paleoclimates, and configuration of the continents. Animations in the form of PowerPoint shows are available from the PLATES�project at the University of Texas. Earth's Interior & Plate Tectonics - covers the following: The Earth's Interior, The Lithosphere & Plate Tectonics, Oceanic Lithosphere, Continental Lithosphere and Plate Tectonics. Plate Tectonic Reconstruction Service. In this section you can calculate plate tectonic reconstructions of any age back to 150 My. This is a cool interactive site. Recognize that fossils contained in sedimentary rock provide evidence of past life forms, changes in life forms, and environmental change. Determine the relative age of fossils in sedimentary rock. Interpret the sequence of rock strata using superposition, cross-cutting relationships, inclusions, the fossil record, and absolute dating techniques. Predict how an environmental change might influence the development of new species or cause the extinction of an existing species.